Lincoln came to City Point to meet with some of his principal officers, to thank the soldiers who were bringing him victory, to see for himself the war’s cost, and to gauge the mood of a defeated South. Considering that this was an active war zone, he ranged about rather freely, taking risks that today’s security protocols would not have allowed. City Point was Lincoln’s base of operations, with the River Queen as his office. 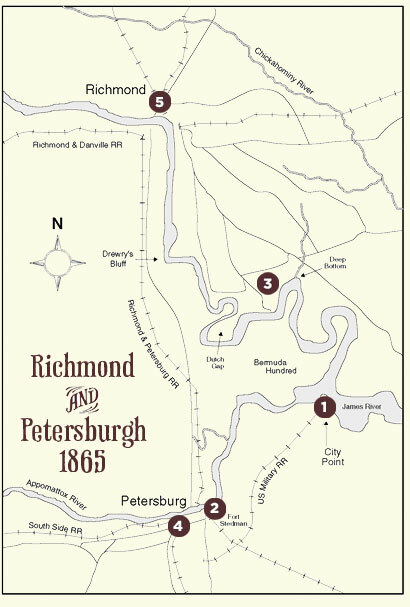 Close at hand were Grant’s headquarters, the military telegraph office, and the Depot Field Hospital. The night Lincoln arrived the Rebels tried to break Grant’s lines at Fort Stedman. The next day Lincoln visited the scene, viewing Union wounded and Confederate POWs. During his visit Lincoln reviewed Union troops on several occasions, the largest taking place north of the James River. Soldiers who saw him, never forgot him. Roughly 12 hours after Rebel soldiers evacuated Petersburg, Lincoln walked in its streets. Boys in blue cheered him and he had some final words with Grant. Lincoln’s visit to Richmond (April 4-5) was powerfully symbolic. He saw abandoned sites of Confederate power, a notorious POW prison, and was mobbed by joyful ex-slaves.